For a delicious supplement to help relax and ease the mind, our new EasyStrain Instant Kava Mix contains only the barest of essentials; pure micronized Noble Kava root that has virtually all of the rough root-stock removed, making for an almost-instant Kava drink that needs no straining. 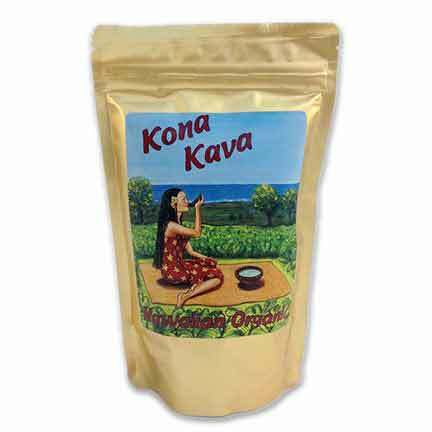 Yes, if you don’t strain, your Kava will be slightly chalky, but with such a smooth flavor, and with such a concentrated serving of Kavalactones, this is one of our favorite new products at Kona Kava Farm, simply because of the intoxicating aroma. Made from a Noble Variety of Kava, this is beyond a simply micronized Kava. This product has carefully had 92% of the rough root material removed, concentrating the Kava so much that it blends well and stays suspended in water! You can choose to do a really quick straining of this product, and you’ll have the same Kava drink as if you had taken the time to massage and extract regular Kava root using something like a muslin bag. We had no idea this would become such a huge hit! This Kava may begin outselling our regular powdered Kava root we sell so much of it! The multi-step process makes this a luxury item, but we do our best to keep the sifters going so this product is in stock when the urge strikes for some super easy, no mess Kava that has all the Kavalactones Kava contains since this is not an extract, but a full natural micronized Kava root. If you’re looking for something even easier, we’ve now got INSTANT KAVA SINGLES that we have a difficult time keeping in stock. These compact little packet of happy are the perfect on-the-go Kava. Simply tear open the foil packet, and dump the entire contents into whatever you’re drinking, whether it’s water, fruit juice, or milk. Blends perfectly and completely every time. Instructions: For each serving, simply put 1 tablespoon in 1/2 cup (125ml) of water and stir thoroughly. A blender works best for mixing (3 minutes). After blended, choose to strain if you wish, or simply enjoy your EasyStrain Instant Kava as it is. We never strain the EasyStrain Kava, and enjoy the large dose of fiber that always does a body good. A great way to unwind in the evening! I loved this product, the taste wasn’t strong, and the kava promoted feelings of inner peace and tranquility. This was the first Kava product I ever bought, and have found it to be wonderful! The total relaxation after a cup of this in milk or almond milk, with some breakfast drink mix to help with the taste, is amazing for a good night’s sleep. Also, I add some of the tincture plus (the 6%) for a nighttime bliss. I highly suggest for anyone with insomnia. Thanks so much for sharing! Definitely good advice to use some kind of milk for your Kava. We, too, love to add some Tincture Plus or some Kavalactone Paste for an extra “kick” to our Kava creations. Glad to know you discovered that same trick for yourself. While I prefer the traditional method of straining and kneading kava root in a big bowl of water, that’s not always possible. My experience with instant products has been that while I do feel some calm, it’s not nearly the same bodily and emotional experience as traditional kava. This product has impressed me very much and is more effective than all other instant products I’ve bought online. If you’re only using instant products, try the regular root. If you are an avid Kava user, this is a wonderful and convenient product that you should add to your stockpile. what variety is this? description only says “noble”. 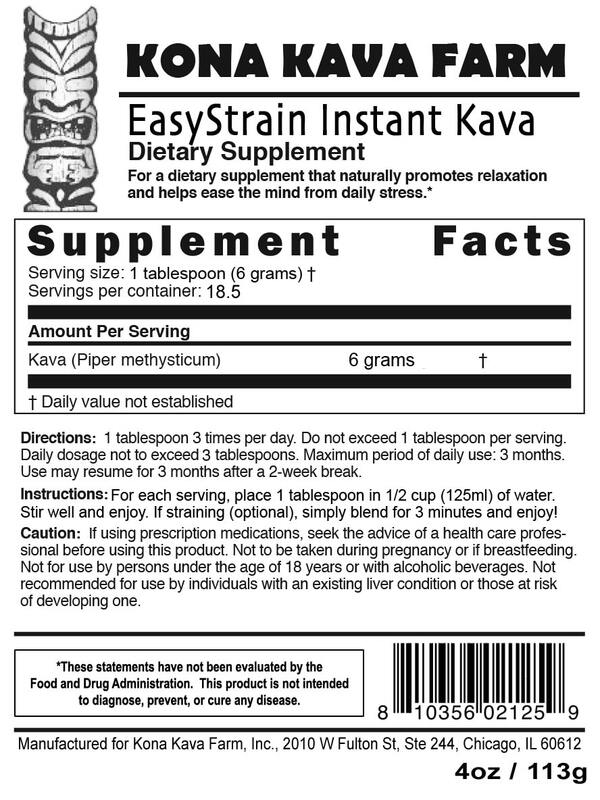 The EasyStrain Instant kava is a Hawaiian noble variety with our signature 2-4-6 kavalactone lineup. Enjoy! Perfect for a quick kava drink!